This commentary discusses the impact of geography in asymmetric warfare in order to analyze how an inferior side acting from a geographical advantage can cast a challenge to the superior party in conflict. As such, the paper focuses on the context of narrow seas, the opportunities and challenges that the geographical configuration of the seas create for adversaries, its impact on their capabilities and influence on their choices. Subsequently, it attempts to illustrate the role of geography in enhancing the efficiency of small arms tactics and unconventional warfare at seas, henceforth, realizing the spatial factor behind the rise of non-state actors as a major threat in maritime security. The commentary then discusses the case of the Houthi insurgency in Yemen to empirically explore their utilization of the geographical location of the country at the southern entrance of the Red Sea, near Bab el-Mandeb Strait in order to execute sporadic military operations against the more superior coalition led by Saudi Arabia. ABDULLA, Khaldon Ahmed; HARNAM SINGH, Jatswan Singh. 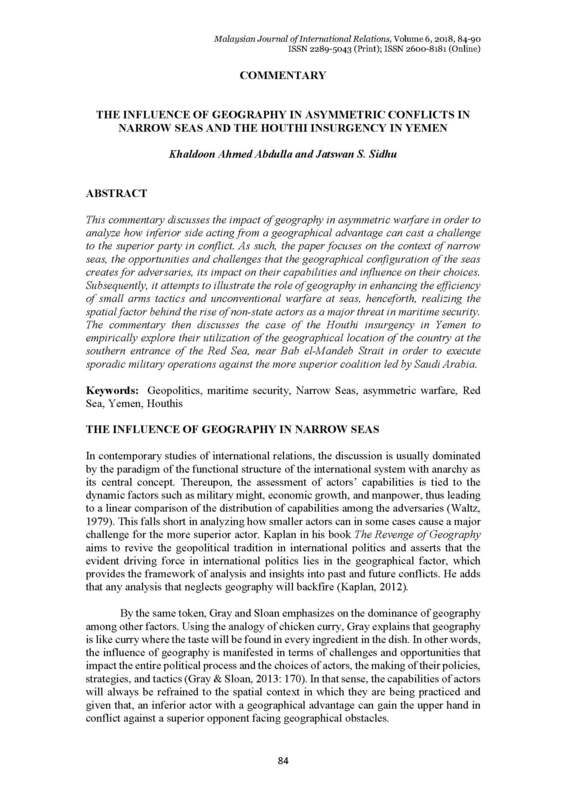 The Influence of Geography in Asymmetric Conflicts in Narrow Seas and the Houthi Insurgency in Yemen. MJIR | Malaysian Journal of International Relations, [S.l. ], v. 6, p. 84-90, dec. 2018. ISSN 2600-8181. Available at: <https://mjir.um.edu.my/article/view/15578>. Date accessed: 26 apr. 2019. doi: https://doi.org/10.22452/mjir.vol6no1.7.